This is supposed to be about me. Well, to know a little about me, you only need to know a little bit. My name is Eric Peterson. I am a Master in Social Work and received both my BSW, and MSW at Aurora University in Aurora, IL, with a few years also spent at Calvin College. I grew up in the same house in Naperville, Illinois until I was 16, and then moved to a different part of Naperville for 4 years until I moved to Montgomery, Illinois where I lived for 4 years. I then moved to New Zealand, where I practiced Social Work full time for 3 years in the youth correctional system. I have now moved back home stateside living in Colorado for the foreseeable future. I love the outdoors (i.e. climbing, camping, hiking), I love doing crazy stuff and I’m a big movie buff. To know some more about myself, just ask, I’d be willing to answer. As for this blog, I named it “Leaves in the Pages” many years ago after a very fortunate day when I was reading a book in Middle school. I was reading…well, I have forgotten what I was reading, but I remember that as I turned the page, there, pressed against the page, was a leaf. 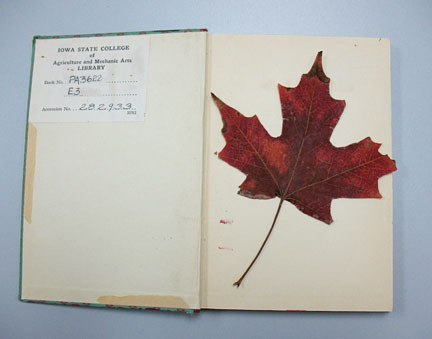 It was a giant, red, leaf that had been preserved in the book for God knows how long. I stopped, picked up the leaf, and immediately began thinking about who left the leaf here? When did they leave it here? What were they doing when they left the leaf here? Were they planning on coming back to this book eventually? Were they in a hurry and needed a quick bookmark, or was it a purposeful and beautiful moment preserved in the pages of story? I didn’t know. What I did know was this: I was going to continue the story. I was going to write about the little things in life, the beautiful things, the important things. Stories that matter, stories that change perspective and engage learning and wonder. I was going to create a blog that exemplified all the innocent and perfect things that the leaf resembled for me so many years ago, and those stories would become…my Leaves in the Pages. Hey Eric, I am an upper cervical chiropractor in Canada. My brother lives in Masterton, NZ. I got to your blog after looking for pictures of headaches. Nice article on headaches your wrote. My brother’s name is Lucas Stauber. Be well. My name is Emily and I am good friends with Allie Robertstad and the rest of the Zehr family. I also work with teenagers, so you and your work in New Zealand has come up in conversation a few times. They told me I should check out your blog and, I must say, you’ve got some great and interesting posts going on here. Keep up the great work and best of luck in your endeavors! I can’t wait to read and learn more! Thanks Emily! I appreciate the interest in my writing and have to commend you on your similar line of work, it’s not easy. Ha, definitely! I teach high school, so it’s a touch different. Still incredibly exhausting, but really the best thing ever! Indeed. This is the county I grew up in. Are you from there? Thank you so much! Quite the honor!